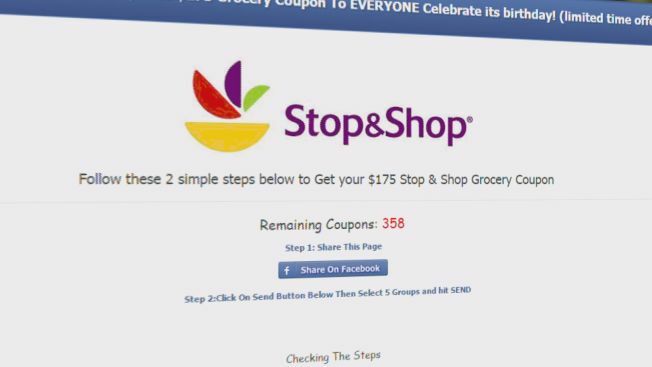 Customers of Stop & Shop supermarkets have been targeted in a recent online “click and share” scheme that appears to promise free groceries and the company is issuing a warning not to fall for it. The scheme promises a free $175 grocery coupon for a limited time to celebrate Stop $ Shop's birthday and includes a counter on how many are left. but the grocery chain said on its Facebook page that it's not real. They have reported it to Facebook, but they are also asking customers to avoid providing the scammers with access to individual Facebook pages. Some local customers said it’s not easy to tell it’s fake. “To be honest, you can’t really tell because it looks real, but it won’t be," Robert Colvin, a Stop & Shop customer from New Haven, said. Others said it is a tempting deal, if only it were real. A similar “click and share” scheme involving Shop Rite went viral in December 2015. Stop & Shop has yet to determine who is behind what it calls “fraudulent” Facebook activity and apologized to customers for any confusion.